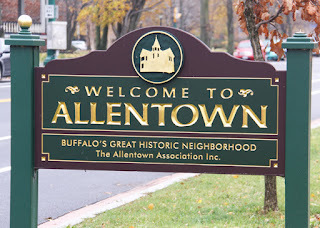 Allentown is named after Lewis F. Allen (1800-1890) who came to Buffalo in April 1827 to serve as Corporate Secretary and Financial Manager of an Insurance company. Allen was also a farmer and when looking for space to let his cattle pasteurize, purportedly his neighbor, Thomas Day, suggested some of his land, which sat between the cities of Buffalo and Black Rock. Allen’s cattle path became known as Allen Street. Notably, Allen was one of the founders of the Buffalo Historical Society and Forest Lawn, where he is buried. Allen was married to Margaret Cleveland Allen and was the uncle of president Grover Cleveland. Allen introduced his nephew to many influential people, including the partners in the law firm of Rogers, Bowen, and Rogers where Cleveland later took a clerkship which led him to practice law and enter into politics.